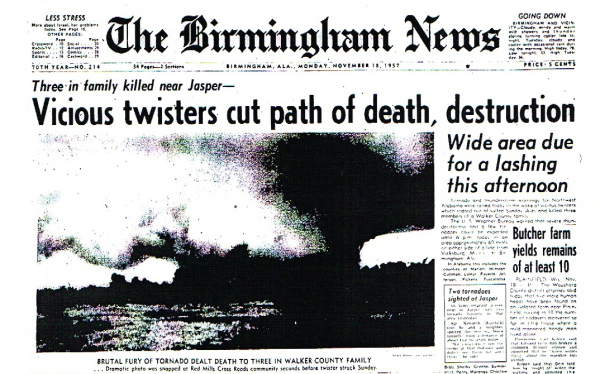 On this date in 1957, Alabama was bracing for another round of severe weather in the wake of tornadoes the day before that killed four in Walker County. On weather maps that morning, the powerful upper rough over the western United States was locked into place, its forward progress blocked by an equally stubborn subtropical high anchored near Key West. A surface low was moving across Arkansas, a prime spot for creating trouble in Alabama. A warm front was over southern Tennesse, putting Alabama squarely in the warm sector of the cyclone, with dewpoints during the pre-dawn hours already in the upper 60s at Birmingham and Montgomery. Low 70 degree dewpoints were over South Alabama and much of southern Mississippi. By afternoon, tornado watches were already in effect along and 60 miles either side of a line from Vicksburg, MS to Birmingham. The first signs of trouble came just after noon when tornadoes touched down in eastern Mississippi. The first signs of trouble in Alabama came around 2:30 p.m. as what was likely an F2 tornado skipped along a 28 mile path from Forkland to near Sawyerville and Havana Junction in Greene and Hale Counties. A few minutes later, further north, a tornado traveled along highway 69 for some three miles north of Tuscaloosa. This same storm may have been the one that produced a tornado in the Birmingham area less than an hour later. The tornado first touched down at 3:30 p.m. in Ensley and moved northeast, affecting North Birmingham around ACIPCO, Tarrant City and Huffman. Pratt City, Dolomite and Pleasant Grove also reported damage. Those communities are all to familiar tornado targets over the years. The tornado was said to have followed a track similar but just to the south of the deadly April 15, 1956 McDonald’s Chapel Tornado that killed 21 people. Five hundred homes were damaged, 35 were injured and one person was killed in the Birmingham area. The fatality occurred on Avenue D in Ensley. The deadliest tornado on that November Monday afternoon was a violent tornado that touched down in Blount County east of Cleveland, passed east of Snead and ended in Marshall County northwest of Albertville after a 27 mile rampage. The four deaths from this tornado occurred in Blount County where forty homes were destroyed. Follow my weather history tweets on Twitter. I am @wxhistorian at Twitter.com.